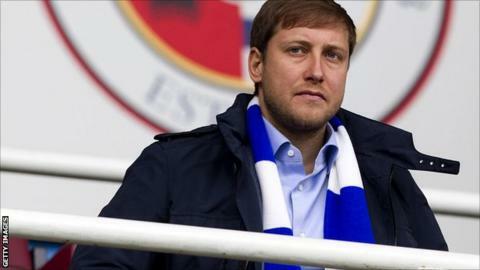 New Reading owner Anton Zingarevich says he wants to establish the club in the Premier League and make an impact in the south west. The area is currently without another Premier League side and the Russian millionaire says the potential reach is over eight million people. He says that potential was a key reason for him buying the club in the summer. "If we do develop things, we can become the biggest club in the south west," Zingarevich told BBC Berkshire. Reading make their return to the Premier League after winning the Championship last season. Zingarevich has invested heavily over the summer signing Pavel Pogrebnyak, Danny Guthrie, Garath McCleary, Chris Gunter and Nicky Shorey. He says despite the investment on the pitch, there is still a lot of work to be done off it before they can establish themselves as a Premier League club. "I come from a family that is passionate about business and having a football club is a business," he said. "I look at it as a business that needs to be developed and that is why I chose Reading. "I think there is a lot of things that can be done at the club and we can develop it much further. There is great potential here, hopefully we can do what it takes. "We did a good job last year. We will try and do the same this year and see where we are at the end of the season. I really believe we can achieve good things this season. "We want to establish ourselves as a Premier League team. There are a number of good examples already in the Premier League but I can say we have much bigger potential in terms of our catchment area." The closest Premier League club to Reading are those in Birmingham (Aston Villa and West Brom) and those in West London (QPR, Fulham, Chelsea) and Southampton in south Hampshire. It is for that reason Zingarevich believes Reading can grow as a club. "There is not much (Premier League) competition around us," he said. "We are not a big club at the moment. We have a good following but not a big following. "But again, if we play well and stay in the Premier League then people will notice us and look at us, because geographically we are the closest Premier League club to them. "If we do well the potential to get those people on board is tremendous. That is what I truly believe. "If you look at numbers there is a potential reach of eight million people in the area. That's huge. Not one single club has that potential."